Walt Disney Animation Studios and Emmy-winning director Rich Moore (TV’s “The Simpsons,” “Futurama”) take movie fanson a hilarious, arcade-game-hopping journey in “Wreck-It Ralph.” Ralph (voice of John C. Reilly, Talladega Nights: The Ballad of Ricky Bobby, Step Brothers) is tired of being overshadowed by Fix-It Felix (voice of Jack McBrayer, “30 Rock”), the “good guy” star of their game who always gets to save the day. But after decades doing the same thing and seeing all the glory go to Felix, Ralph decides he’s tired of playing the role of a bad guy. He takes matters into his own massive hands and sets off on a game-hopping journey across the arcade through every generation of video games to prove he’s got what it takes to be a hero. On his quest, he meets the tough-as-nails Sergeant Calhoun (voice of Jane Lynch, TV’s “Glee”) from the first-person action game Hero’s Duty. But it’s the feisty misfit Vanellope von Schweetz (voice of Sarah Silverman, “The Sarah Silverman Program”) from the candy-coated cart racing game, Sugar Rush, whose world is threatened when Ralph accidentally unleashes a deadly enemy that threatens the entire arcade. Will Ralph realize his dream and save the day before it’s too late? Much like how Who Framed Roger Rabbit brought together a collection of famous cartoon characters into one movie to have them interact with each other in a shared world, Wreck-It Ralph follows the same concept but with video-game characters. All of the characters share their games in the Litwak Arcade (sadly no Tron game is there) and at when the arcade closes, they come to life like the toys from Toy Story. By crossing the power cables, the characters all meet up in a central hub where they can visit other games. One of the longest lasting games in the arcade is Fix-It Felix Jr. which has been around for thirty years. The games’ characters include the eponymous Felix Jr. (Jack McBrayer) whose specialty is fixing the damage done by the destructive Wreck-It Ralph (John C. Reilly) who breaks the windows on an apartment building ala Rampage. Every night, after being beaten by Felix and thrown off the building’s roof and into a mud puddle below, Ralph trudges to his home in the junkyard where he gets to see Felix and the others have a party and celebrate. Lonely and tired of being the bad guy, Ralph travels through the hub to participate in a support group with other video game bad guys. At the group, Ralph shocks his fellow villains with his desire to stop being a bad guy. When he returns to his own game, Ralph notices that the other characters are all having a party to celebrate the games’ 30th anniversary without him. When Ralph crashes the party, Felix tries to keep everyone civil but the rest of the characters want nothing to do with Ralph and tell him that if he wants to be accepted he better get a big medal like the one Felix wins every game. While drinking his misery away at Tapper’s, Ralph learns that another game called Hero’s Duty offers a medal to the winner if they can survive the onslaught of thousands of bugs. The game is a first person shooter and Ralph takes a soldier’s place to infiltrate the game so he can try to win the medal. While in the game, he meets Sergeant Calhoun (Jane Lynch), a tough no nonsense leader who is passionate about killing the bugs and keeping her squad alive. Needless to say, Ralph is ill-prepared for the rough game and not only runs from the bugs but almost ruins the game experience for the player, when he breaks protocol by doing his own thing like running in terror. In between game sessions, Ralph climbs up the tower where the medallion is located and manages to obtain it (and accidentally one of the bugs) before leaving the game. On the flight back, Ralph is jumped by the stowaway bug which causes him to crash land in a girlie candy-filled kart-racing game called Sugar Rush. During the crash, Ralph loses his medal which is recovered by one of the Sugar Rush residents called Venellope (Sarah Silverman), a precocious young girl who impishly runs off with his medal and turns in it to qualify for a race that she’d been shut out of. It turns out that Venellope is a glitch in the system and the ruler of the land King Candy (Alan Tudyk) has done everything in his power to keep her excluded from racing until now. Venellope tells Ralph that he can get his medal back if she wins the race so he agrees to help her by building her a kart and teaching her how to drive. Thanks to Ralph being absent from Fix-It Felix Jr., a player informs the arcade owner Litwak that the game isn’t working right, and the game is made out of order which means that the game is about to be unplugged which would make them all homeless. Felix decides to go after Ralph and to bring him back to their game before they are unplugged. Sergeant Calhoun is also looking for Ralph so she can neutralize the bug that escaped with him before the bug lays it’s eggs and destroys the entire game environment. She teams up with Felix and together they journey to Sugar Rush in an effort to save everyone from the destructive annihilation that the bugs are sure to bring about. 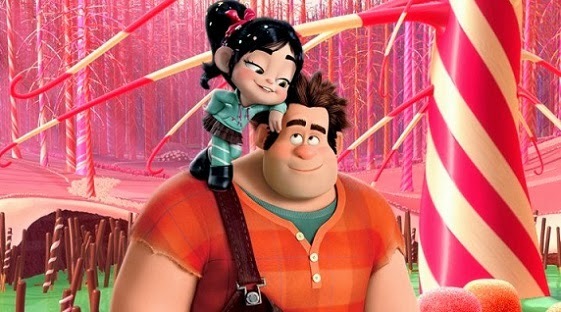 I really liked Wreck-It Ralph as a film until he crash landed in “Sugar Rush” which hurt the movie in my opinion, as I was not a fan of the land or the Vanellope character. It’s a shame because the first half of the movie was very cool and interesting and then the movie gets stuck in the same sugary goo as Ralph does when he arrives in that colorful world. To be fair, I’m sure a lot of it is because I prefer the 8-bit world of Fix-It Felix Jr. and the hyper-realistic shooter “Hero’s Duty” far more than the syrupy antics of those in Candy Land (Sugar Rush). I also wish they hadn’t imitated the Iron Giant ending with Ralph trying to prove he was more than what he was intended for. The movie works as a whole, but it could have been much better if it had finished as strongly as it started. Despite those issues, I really liked the movie and the nostalgia of seeing the classic game characters worked its magic on me. The voice acting is great across the board, especially John C. Reilly as Ralph who was inspired casting. The animation is fantastic and I really liked how they made each game world look true to its roots and distinct from one another. If they do make a sequel, (and it sounds like they are planning on it), I really hope they drop the whole Sugar Rush concept and go to a new game world we haven’t seen yet like “Dungeons and Dragons” or “Pitfall” or something along those lines. Once again, Disney has delivered another reference quality presentation that is simply stunning. This 1080p (2.39:1) transfer will catch a lot of people by surprise by just how good it is, especially the 3D version which is significantly better than the 3D print I saw in the theaters. The film wisely starts off in 2D as we start off in the real world before being inroduced to the Fix-it Felix game and its characters before jumping into the 3D, an effect that’s similar to The Wizard of Oz’s jump to color from black and white and it’s just as startling. From the glorious 16 bit wonder of the early games to the high definition sheen of Hero’s Duty, this transfer works on every level. Colors are eye-popping and leap off the screen (especially in the Candy Land segment), and the black levels are wonderfully inky and dark when Ralph enters the nightmarish game world of Hero’s Duty. Both versions of the film look incredible but I have to say that the transfer to beat is the 3D version as it gives the game worlds a level of dimensionality which makes you feel as if you are in the game and adds a lot of immersiveness to the film. There’s not a lot of gimmicky 3D effects that come out of the screen but the ones that do (like the barrel of a gun) are done well and are very cool looking. Both transfers are flawless and the 3D version doesn’t even suffer from the ghosting that many other 3D releases are plagued with. Considering that I saw this movie in the theater in 3D, I was still suprised by how much better the movie looks on Blu-ray. Another welcome surprise was Wreck-it Ralph’s DTS-HD Master Audio 7.1 mix which blew the roof off during the Hero’s Duty first person action sequence. This sequence was my favorite part of the movie and the best part of this audio mix. Hearing the multitude of Cy-Bugs swarm the terrified soldiers amid weaponfire just sounds amazing and the directional effects are extremely accurate and enveloping. When the LFE channel kicks in, you will feel it along with the rest of your house! The other game worlds also sound great too with each one offering its own distinct charm. From the simple music and sound effects from Fix-it Felix to the roaring racecars in Sugar Land as they race through a saccharine utopia, they all sound fantastic and adaptable as the movie itself. The dialogue is crystal clear no matter what kind of action is taking place on screen and the music sounds just as sharp without every overwhelming the rest of the mix. This is a showcase for audiophiles and fans will be thrilled to hear it! I’ve already told you the good news…now comes the bad news. For a set that bills itself as an “Ultimate Collection” this Blu-ray is seriously lacking in extras. Considering how many extras I just had to type up for Disney’s other recent release of Monsters, Inc., the selection of extras included here is fairly pitiful. I have a feeling that there will be an eventual double dip on this movie. Paperman: Theatrical Short – This is the Academy Award winning short that played before the movie about a young man and woman who are brought together by fate…and some paper. It’s very cute and blends 2D and 3D animation well and takes advantage of the strengths of both. You have two ways to watch this short – in 3D on dic one and in 2D on disc two. Bit by Bit: Creating the Worlds of Wreck-It Ralph – If you want to learn about the making of this movie, this featurette is all you are going to get but it’s informative and interesting. We hear from director Rich Moore, producer Clark Spencer, writer Phil Johnston, art directors Mike Gabriel and Ian Gooding, effects supervisor Cesar Velazquez, animation supervisor Renato Dos Anjos and others who talk about creating the game worlds and how they all tie together in the game station hub. I really wanted to hear more than the seventeen minutes we get, but at least this is really good despite its short running time. Alternate & Deleted Scenes – We also get about fourteen minutes of deleted and alternate scenes including: “Ralph in Hero’s Duty Prison,” “The Maize Maze,” “Vanellope’s Volcano” and “Extreme EZ Livin’ 2″ that’s hosted by director Rich Moore who also offers an optional commentary for each. Disney Intermission – Every time I see this new and innovative extra, it makes me happy because it’s so cool and usually a lot of fun. This time it’s a little less fun because it’s hosted by the smarmy Chris Hardwick who really needs to go back to his podcast. Whenever Wreck-It Ralph is paused Hardwick will pop up and talk about the hidden references and in-jokes in the movie. While the info itself is interesting, I really wish they had gone with one of the movie characters (like usual) or someone else. While I wish the movie hadn’t spent so much time in Candy Land, the rest of the movie is a lot of fun and it was great seeing all of the old video game characters together. The animation is superb, the voice acting is extremely well done (especially by John C. Reilly), and this Blu-ray really makes this movie shine. The video and audio quality are exceptional with the only weak part of this set being the limited extras. Despite my previous misgivings, I still highly recommend the movie as it’s rare to see a fun movie that the whole family can enjoy.